Tall boots are all the rage and while new Spring shoes make it appear that you could run around in sandals already, not quite yet.. And just in time, the Kors by Michael Kors Beat Suede Lug Boot is on Sale! at Footnotesonline. Available in Black and Charcoal Brown, this comfortable lug, rubber soled boot features a side zipper, is leather lined and sits on a 1″ lift. Every woman’s favorite word – SALE! 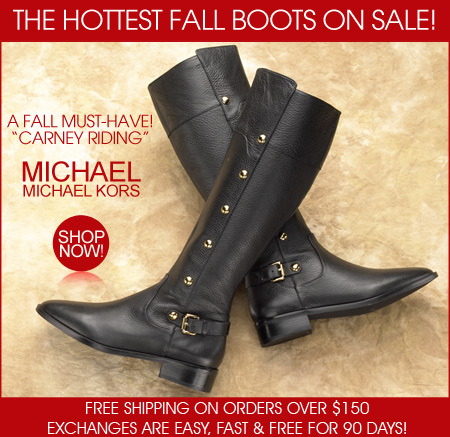 The Footnotesonline Semi-Annual Sale continues with savings of 50% off almost all 2007 Fall/Winter Boots and Shoes – including the Kors by Michael Kors Beat and Franco Sarto Branzino. The Details: Black polished calf tapered toe boot on 3/4″ heel. Finished on leather soles. Side zipper. Leather lined insoles. Regular Price: Regular Price: $395.00 | ON SALE! $276.50 At: Kors by Michael Kors at Footnotesonline.